How to draft a Software Product Manager Resume that will impress? 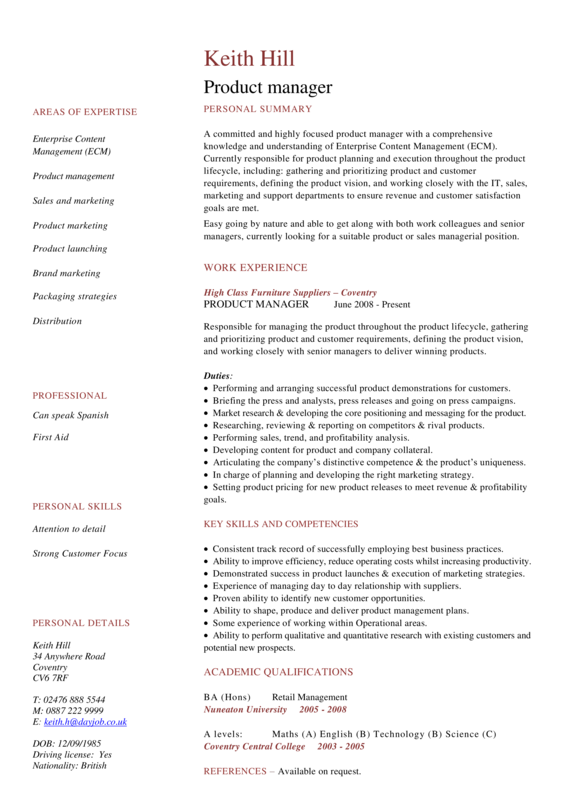 Download this Software Product Manager Resume template now! This Software Product Manager Resume template will grab your future employer its attention. After downloading and filling in the blanks, you can customize every detail and appearance of your resume and finish. Completing your Software Product Manager Resume has never been easier, and will be finished within in minutes... Download it now! Product launching Brand marketing Packaging strategies Distribution PROFESSIONAL Can speak Spanish First Aid PERSONAL SKILLS Attention to detail Strong Customer Focus PERSONAL DETAILS keith.h dayjob.co.uk DOB: = Driving license: Yes Nationality: British WORK EXPERIENCE High Class Furniture Suppliers – Coventry PRODUCT MANAGER Responsible for managing the product throughout the product lifecycle, gathering and prioritizing product and customer requirements, defining the product vision, and working closely with senior managers to deliver winning products.